Written in response to a Secret Santa Challenge in 2011. Takes place post-war in some nebulous time wherein the war is over and people are just getting on with the business of living. Harry's been receiving anonymous gifts from someone who clearly knows things about Harry that they shouldn't. Harry looked disconcertingly at the package that had been delivered that morning. He wasn’t sure if he should open it or not. He was a little afraid to. Neville sat down in the chair across from his friend. He had gotten a little taller in the past year and lost some of his baby fat, but what really seemed to make him more noticeable to most people now was that he was more assertive than he used to be. Harry had always known he had that confidence in him; it just took a while to come to the surface. Neville had entered the room right on time and set his bag on the floor just inside the sometimes-absent door. “Should I?” Harry asked, looking up at his friend. Harry nodded and cautiously lifted the box. It wasn’t heavy and didn’t seem to move around, not giving any indication to the contents. Harry took a deep breath and untied the blue ribbon surrounding the box before slowly removing the lid. At first glance it appeared to be empty; however, when Harry looked closer he noticed a slip of parchment sat at the bottom. He frowned and lifted the paper out. “What’s it say?” Neville asked curiously. “Like I said, a Slytherin,” Neville reiterated. “Or very Marauder-like.” He paused. “You don’t think it’s Remus, do you? Or one of the twins? Because that would be…” He shook his head, because… no. Harry nodded, placed the lid back on the box, tapped it with his wand, repeated the passphrase and stood back slightly, unsure what would happen next if anything. After no further movement, Harry stepped forward and gently lifted the lid. “It does appear that way,” Harry acknowledged as he lifted out the small case from the box. It was a set of wizard’s tools designed to manipulate wards. From the look of them they were very well made, and no doubt expensive, especially when you consider that buying these types of tools was next to impossible even by disreputable sources. According to the book he had received two weeks ago from his admirer the key to building impenetrable wards, and thereby removing or breaking them down, lay not only in a witch or wizard’s level of power but in the skill he or she used to employ a particular set of hard to manufacture, and therefore hard to find, tools. While possession of the book or the tools could lend themselves to a trade in Warding, they were not the acceptable tools approved by the Ministry. No, these were more like something that belonged to someone whose job it is to dismantle wards. The disturbing part about this gift, and the book before it was that Neville was correct: whoever was sending these presents must know something about him that most others did not. He’d spent the summer after sixth year doing a lot of reconnaissance on Voldemort and his Death Eaters. So much so, that he’d developed an unexpected affinity for breaking and entering, which in wizarding homes was quite the challenge. His trips into various dark wizarding homes had eventually provided him with key information that allowed him to face Voldemort for the last time. He’d walked away from that challenge with a few pieces of information he wasn’t quite sure how to assimilate into the boy-hero image everyone expected of him. If he could somehow figure out a career from that, he might know what to do with himself once he graduated. Judging from his most recent gift, maybe someone already had. Harry looked cautiously at the items spread out on the coffee table the room had provided this time. There was something niggling him about these gifts. He had received the fourth one at breakfast that morning and he was beginning to suspect that they didn’t all come from the same person, which was puzzling. All four of the notes were written by the same hand, of that he was sure. However, the gifts, themselves, felt like they were from different people. His first gift, a book written two centuries ago which explained in very detailed terms both the theory and the practice towards creating complex wards, and the complexities required for dismantling those same wards, went along with his third gift. Like the tools, the book was very hard to find and considered virtually illegal. Harry had spent several months attempting to find a copy of it himself without any luck. His second gift was a box made of etched crystal. The box itself wasn’t too unusual, except for the fact that it had two hidden compartments which were not discernable from the outside. It was very similar to a box Harry had admired at Professor Slughorn’s during one of those disastrous Slug Club dinners. It could be a coincidence, but Harry didn’t think so. If it wasn’t, it meant whoever had sent the second gift was at the dinner, and watching him. He wasn’t sure how he felt about that. His second gift had a different vibe from the other two. Harry was starting to think that maybe he had two gift-givers and not one. However, if that was the case, they were working together since all of the notes had been penned by the same hand. He had checked and found no evidence of any type of spell used to conceal the penmanship. The only spells on the parchment at all were to ensure Harry was the only one who read them, which Harry considered more evidence of Neville’s Slytherin theory. This last gift was something he’d never seen in person, though he had read about them. It was a Nascosto crystal, spherical in shape, about the size of a Snitch. They were extremely rare and expensive and originated in Italy before the Italian Ministry determined they were used primarily by dark wizards. They had the ability to cloak a person’s magical signature, though some found them useless as heirlooms since they could only be tied to one user, and, therefore, couldn’t be passed down through the generations. It was beautiful and, amazingly, unused. Clearly, whoever had found it for him meant these gifts as something more than a game. While the cloaking ability might lead him to think this gift was from the same person as the book and the tools, the sheer beauty of the crystal made Harry think it was actually from the second gift-giver. Each gift seemed to indicate that whoever was behind these had wealth as well as keen observation skills. His admirers, if in fact, that’s what they were, had been watching him enough to know that he might have a use for all of these things. Harry wasn’t sure if he should be interested or alarmed. When the owl swooped down to the table the next morning, Harry found himself slightly disappointed that it carried only a rolled parchment. He had become used to the package the eagle owl usually had clasped in its talons. “No gift?” Neville asked from next to him. They were among the last to leave the Gryffindor table. Harry had begun to suspect that his gift-givers planned it that way. The gifts never arrived when breakfast was in full swing, only when there were only one or two people left, mostly sitting away from Harry. Neville was the only Gryffindor that was ever close enough to Harry to really see what was being delivered. “Nope.” Harry looked across the Great Hall to the Slytherin table, trying to see if anyone, in particular, was paying attention. The only ones left there were a few third years, and Harry seriously doubted it was one of them. He slowly unrolled the parchment, not sure why he was so nervous, but this felt different. There was no signature, but there was an unusual drawing: a large snake entwined with a lion, accented with both red and green. If that didn’t indicate that his mysterious gift-givers were Slytherin, he didn’t know what did. “How do they know I can get out of the school at that time?” Harry asked. “Yeah, that’s what I was thinking.” Harry sighed and folded the parchment up again, slipping it into the pocket of his robes. “You are going to go, aren’t you?” Neville asked after a minute. “Not to mention expensive,” Neville agreed. “You don’t think it’s him anymore?” Neville had been leaning towards the same direction. While Harry and Malfoy’s relationship couldn’t be considered friendly, they had been less antagonistic towards each other in the past year, mostly since Voldemort had been destroyed and Malfoy had come into his inheritance. “You still think that it’s more than one person?” Neville thought to himself, but wasn’t sure how it all fit together. Harry nodded. “What if it’s not a game, Neville?” Harry whispered, not sure if he was ready to deal with the consequences if this was more than just a passing interest. Harry approached the Shrieking Shack and frowned as he felt the wards surrounding the place. There had never been wards here before—at least not since he had learned of the place. These wards were strong too, and if he wasn’t mistaken, complicated. He stared at them, perplexed. Then he smiled. This was a test. Grinning, he headed back towards the school. He’d need a little help from his unique gifts to get inside. Once he retrieved his new tools he returned to the Shrieking Shack. He approached the building cautiously and used his wand to magically observe the wards surrounding the building; he cast the revealing spell the book recommended and watched as several different colored lines appeared around the doorway. The wards extended around the entire building, but he could only see the lines around the doorway where he had cast the spell. He smiled at the complexity of the spells and set to work unraveling them. Harry took a deep breath and pushed out with his magic while keeping the rest of the wards from reactivating. He could feel the last complex spell unravel; there was a final spark of power and an orange spell light shot off into the darkness. Harry paused for a moment. If he wasn’t mistaken that orange light was some sort of message. But to who? He shook his head and turned towards the building, then sent another testing wave of power through it, trying to detect what might be contained within. He could feel two separate magical signatures. One was only vaguely familiar, but the other was a signature he recognized from many interactions with it, most of them under the most unpleasant of circumstances. Harry put his tools away and entered the room cautiously. The room was dark, only a single lantern lighting the large room. However, there was enough light for him to recognize the two people waiting for him. Harry came all the way into the room and allowed the door to close behind him. He couldn’t find it in himself to be even vaguely surprised; both Zabini and Malfoy were on the short list of Slytherin suspects. And he had known Malfoy’s magical signature, perhaps even better than that of a friend, due to the number of spells they had cast at one another over the years. The question now was why. “I’m here. What do you want?” Harry asked. Harry stared at the Slytherins for a long moment. He noticed the way that Zabini referred to Malfoy by his first name and Harry by his last. He could admit, if only to himself, that he was intrigued by both these two boys and what they might have in mind. “We have a proposition for you,” Malfoy stated, his lips quirked in a slight smirk. “Both of you?” Harry asked, glancing from Blaise to Draco. 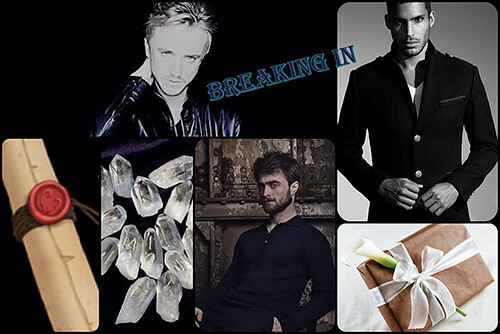 They were very striking together—Zabini with his dark looks and Malfoy with his blond hair and pale complexion. Harry’s eyes widened slightly. “My services? But I don’t have any real experience… at least none you could market.” He blushed, thinking of all the nights he’d broken into Death Eaters’ homes and the things he’d witnessed while waiting until the Death Eaters retired for the night so he could snoop. “This is why we’ve arranged for your apprenticeship with Mavin Merryweather,” Blaise said slyly, knowing that if Harry had read the book they’d gotten for him he would know that Merryweather was an expert in every type of warding, both legal and illegal. She hadn’t taken an apprentice in over ninety years and had been a recluse for the past forty. Malfoy shrugged. “Doesn’t matter how. What matters is that she agreed, if we could prove you had talent. Which you have now done for us.” Malfoy waved a hand towards the entrance Harry had come through. “The message light,” Harry whispered in realization. “I told you he wasn’t as stupid as I’ve assumed,” Draco said to Blaise, a slight smile on his lips. “Well, that’s a bit more… personal,” Malfoy admitted. “Yes, but that’s not all we want,” Blaise confirmed. “And this… business proposition is contingent on me sleeping with you?” Harry asked incredulously. He didn’t think either of the Slytherins needed to resort to extortion. “Does it matter, Potter?” Malfoy asked. “If we’re going to be sleeping together don’t you think you should call me Harry, Draco?” Harry asked, his own eyebrow rising in challenge. “Is that a yes, Harry?” Blaise asked, his mouth caressing the name in a way that just wasn’t possible when he called him by his surname. Harry tilted his head slightly, looking from Draco to Blaise and back again. He couldn’t deny their attractiveness, nor his interest in their offer. An apprenticeship with Mavin Merryweather… that was way better than any of the offers the Ministry had handed him. And sleeping with two of the hottest boys in his year—that would be the easy part. The mental imagery of this is absolutely SMOKIN’!!! 😀 Thanks for this! Intriguing start to Harry’s apprenticeship and relationship with the 2 Slytherins. Nice! (fans herself) Very, very nice indeed. The mental imagery of what happens next is just delicious. Thank you for warming me up so delightfully on this cool winter’s day.